• Anybody can paraglide, and you don’t have to be military personnel or an avid fitness bloke to fly midair. Most of these stunt skills are learned and acquired with training. The more you are exposed to know how it works the better you become at it. 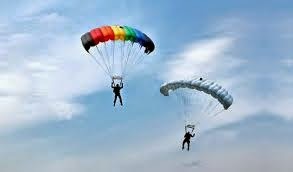 • Many people own their paragliding apparatus so go with yours to event locations. Some venues like the table mountain or 12 Apostles in Cape Town are known paragliding sites where you can get help to start your journey. There are schools as well where you need to enroll to complete the flying module, get the needed support and skills. • People assess the risk in paragliding in different ways, but many believe the level of risk is not more than that of driving a bike. A ratio of fatality of 4 /10,000 rides is commonly bandied. One dude gave a friendly advice; do not wait for the statistics that are tossed about otherwise you will remain a beginner forever. • Some say why paraglide when you can go on the race cars or go biking? They forget that every sport has got its fatality. Very much like driving a car, you may never know how thrilling it can be until you experience it. Sign up to be trained today and catch a buzz. • You should not be fearful of a freefall because there is always a trailing edge that holds you on and keeps you steady even when airborne. Many who have learned paragliding lose their fear of heights and concentrate on honing their skills on how to steer and steady their flight while perfecting the all-important landing routine. • Some people assume that you cannot fly the same set of wing at different places with different local conditions or wind strength. In Cape Town people paraglide with their personal equipment anywhere. Previous instructional classes help to guide you in deciding the optimal conditions to fly in, and the skill set to apply. • Thermic air is always less stable but helps you stay up there a lot longer just like high performing gliders normally do even though they are less stable but have been certified to be more responsive. • Fellow pilots are a good resource when you fly, and it is not always advisable to fly alone; which is why it is good to have formal instruction so you can decode what to do when things go wrong. Unlike terrestrial sports, where some learn by trial and error, you don’t have a chance if you are paraglide. Some risks are better avoided than others at such fluid conditions when midair and in extreme conditions. • Getting on the flying wing with a high-quality instructor is very advisable so as to get a good feedback on a beginner wing. The risk in piloting is less when you learn the ropes with a good instructor. It is advisable you get an instructor or attend a learning school before going for any flight.